by Kathryn.In social media, technology.5 Comments on Searching with friends: will Google’s Social Search help with serendipity? Your friends and contacts are a key part of your life online. Most people on the web today make social connections and publish web content in many different ways, including blogs, status updates and tweets. This translates to a public social web of content that has special relevance to each person…. Google Social Search […] helps you find more relevant public content from your broader social circle. If you’re signed in [to your Google account], Google makes a best guess about whose public content you may want to see in your results, including people from your Google chat buddy list, your Google Contacts, the people you’re following in Google Reader and Buzz, and the networks you’ve linked from your Google profile or Google Account. For public networks like Twitter, Google finds your friends and sees who they’re publicly connected to as well. You can see a complete list of the people included in your social search results in your personal Google Dashboard (this display is private). The last sentence is important. It’s worth a visit to your Google Dashboard to see what and who Goggle has connected you to, and to what extent you mind this. Secondly that they are making this transparent. For instance, on checking my dashboard I was reminded of my brief flirtation with Google Buzz, where it seems that I whilst I made the the account private (ie. in my view deactivated it) I somehow still have 17 followers. The dashboard also reveals how many contacts you have in Gmail, the number of conversations you have in your inbox, the number in all your mail and so on. All this information I’m presuming Google Social Search is going to use to give me relevant results. But how useful are these type of results? 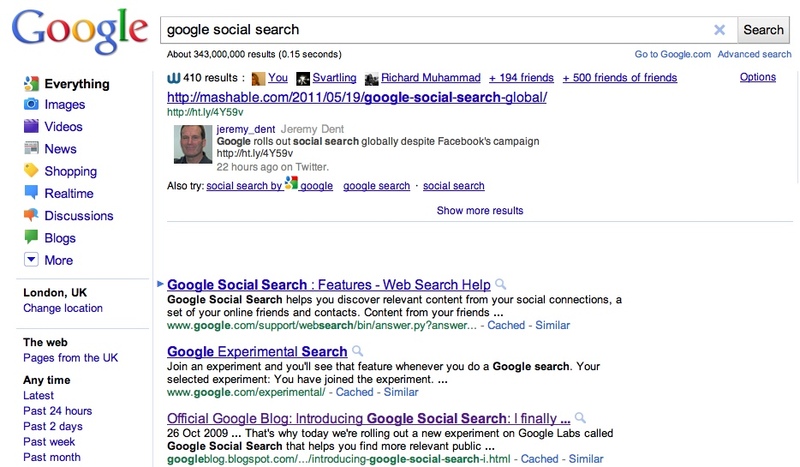 In this example, the lovely Jeremy Dent Tweeted out about Google’s Social Search yesterday with a link to the news. What I’ve found however is that whilst I follow a lot of clever people, the search results are rarely as relevant as the example above. The results I receive suit specific types of information, in my instance news and technology, as this reflects the kinds of people I follow on Twitter. Yet, only once or twice have a clicked on a link provided by one of my friends. Now this doesn’t mean that the tool is useless, more it reflects what I use Google for and why I use Twitter are quite distinct. And this will vary for everyone. What the results do help with, as with Google Ad Words, is affirmation. So if you’ve found a result via Google’s standard research and the same result or something similar or highly related comes up within the Wajam result there is a sense of affirmation of the result’s relevancy. However, this could also lead the the problem that I now find Google quite useless for: unusual (but good and relevant) results or things from the deep web. The potential for Google’s Social Search to simply increase the likelihood of existing, well known content and well linked to surface is perhaps greater that than more serendipitous content appearing. It is the latter that I really would like in my search results somewhere. With some news events I notice talk about it on twitter. I then do a Google News search to find out what has actually happened at [place] or with [person]/[organisation] from a more firm(potentially reliable) source. Annoyingly Google lists loads of twitter statuses (which are generally the reaction, not what it is) before I scroll down to any actual news sites/papers. Ah, yes, that can be quite a problem. Have a go of Google’s Real Time search instead – http://www.google.co.uk/realtime and click on the Timeline to the right to go back in time.